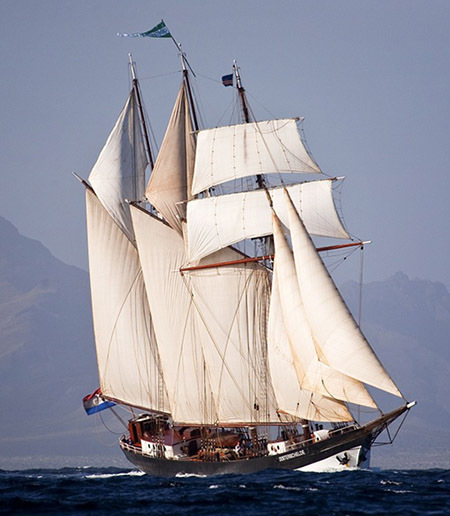 The Miramichi Festival of Tall Ships 2017 will feature The Oosterschelde from Veerhaven, Rotterdam. The Oosterschelde is the last remaining schooner that sailed under the Dutch flag from the beginning of the 20th century. This Dutch colossal of the sea was built in the Netherlands in 1918 and was originally made as a freighter ship to carry hundreds of tons of supplies until it was bought privately in 1921 by a Captain Kramer. After being sold multiple times and 70 years of sailing and voyages, it was bought for the final time. Restorations began in 1988 and was completely restored to its natural beauty in 1992. A sight to behold and towering at 164 ft tall, this massive schooner is over 141 ft from stern to stem and can be seen miles away as its 3 mast appears to be touching the clouds. A glorious sight to be held. The Oosterschelde features 6 two person cabins and 3 four person cabins, with 5 showers and 5 bathrooms and can entertain up to 120 guests for a day trip or house 24 guests for voyages. The entire interior of the ship is lined with original red oak wood and grey ash flooring. The walls are also covered with original red wood and dark stained trim that separates the greenish beige paint on the ceilings. The Oosterschelde features an eat-in kitchen equipped with chandelier lighting and 10 foot hard oak tables with leather back lined seating complete with skylight viewing from the center of the room. A library contains classic literature about the ship and other nautical adventures and there’s a fully stocked bar with granite countertop and gorgeous hardwood furniture. The sleeping quarters highlights simplicity with handmade bunk beds from oak wood and a small cabinet to store personal belongings. The top bunk features a skylight to view the stars as you peacefully fall asleep to the gentle cradling of the sea waves. As you stand onboard the ship, you will immediately notice the 3 monumental masts towering above you. You will be overwhelmed by the jungle of ropes and ties that support the 10 massive sails as they dance gracefully in the wind. Enjoy the breathtaking view of the ocean as you stand behind the helm and join us to experience the rich history of the Oosterschelde.